Excitement. It is tangible and all around us, in our voices as we discuss Sheena’s work at Bert Fox, under our feet as we amble the streets of Fort Qu’Appelle, and in our eyes, as we seek the treaty monuments we have come to see. Mike tells us about the two treaty monuments, hinting that they are very different. We stumble across the first one, put in place by First Nations Chiefs in 1987. 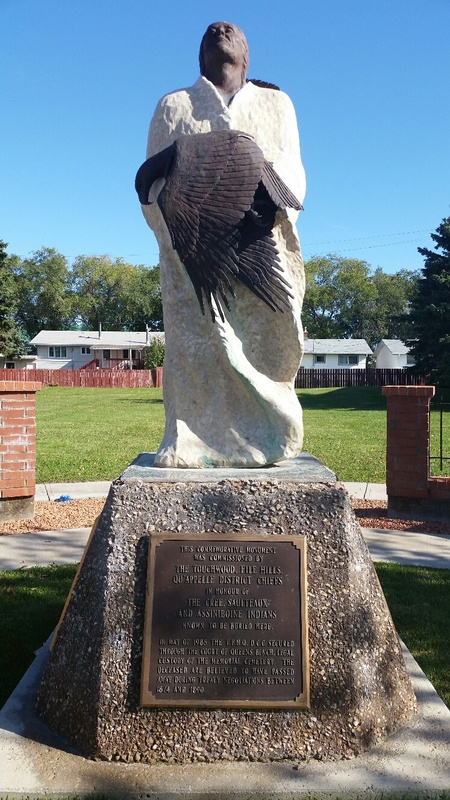 It is a beautiful sculpture of a First Nations man holding a golden eagle with his gaze turned up to the sky. 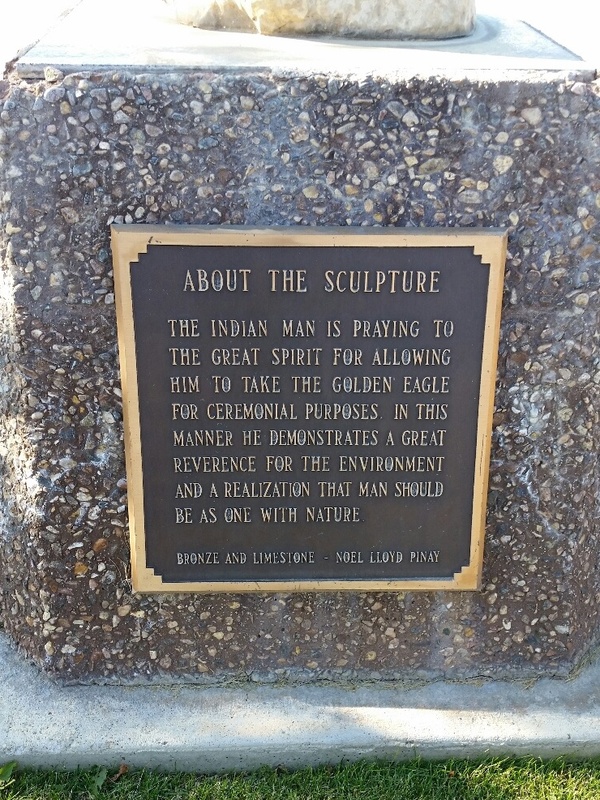 The plaque tells us that he is praying to the Great Spirit for allowing him to take the golden eagle for ceremonial purposes, which demonstrates reverence for the environment. 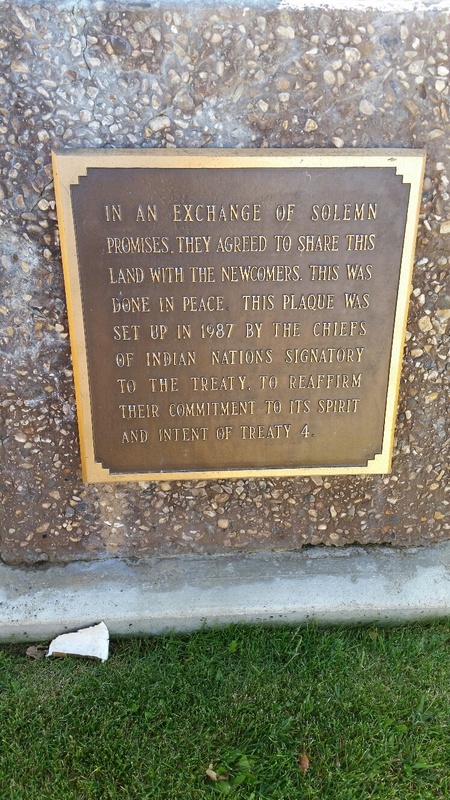 Another plaque explains how the First Nations peoples agreed to share this land with newcomers peacefully, in an exchange of solemn promises. 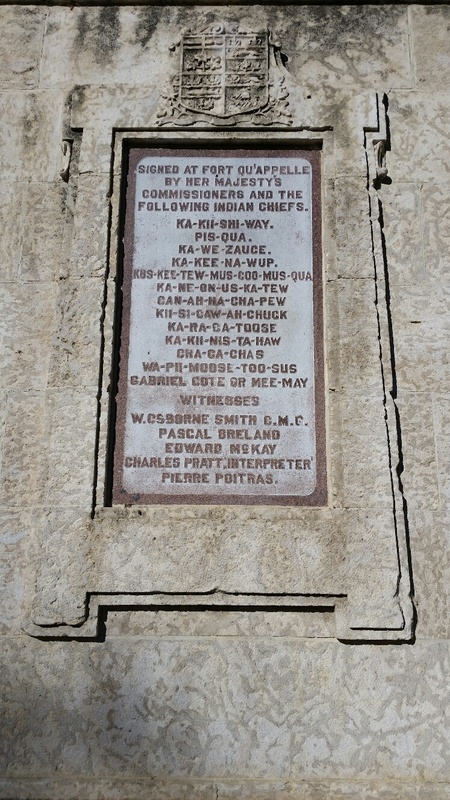 This monument was set up to reaffirm the chiefs’ commitment to the spirit and intent of Treaty Four. 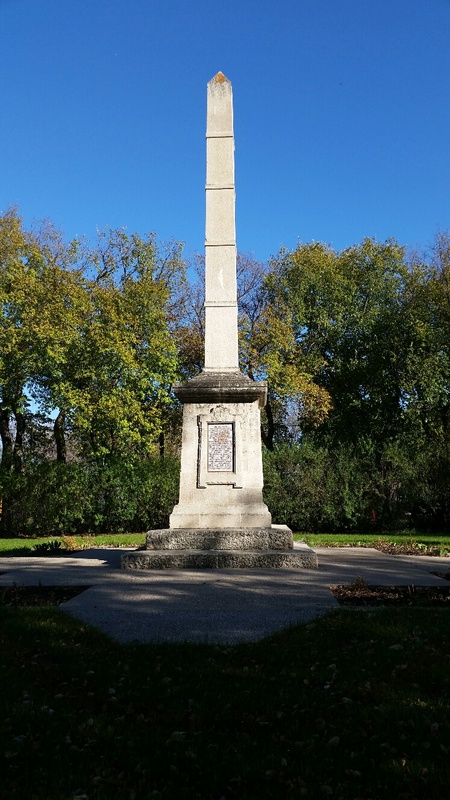 It also commemorates a burial ground, where Cree, Saulteaux, and Assiniboine peoples are known to be buried. “And hopeful, isn’t it?” asks Mike. Hopeful, indeed. Although some Treaty promises were not being fulfilled, the Chiefs still showed their commitment to the Treaty, hoping that the oral understanding they had come to would be honoured. We are quieter as we walk back to Mike’s vehicle, reflecting. We squish in and drive around, looking for the other treaty monument. We talk about how there are no signs for these important historical monuments. 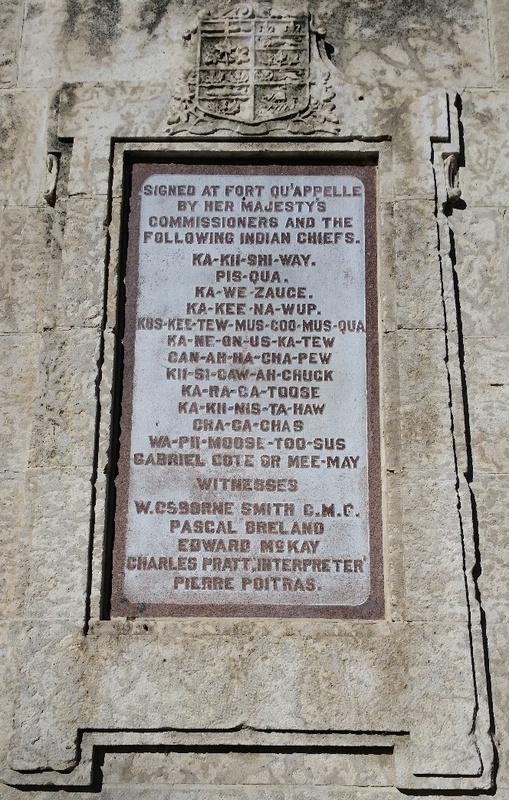 I think aloud how crazy it is that I grew up only 15 minutes away Fort Qu’Appelle, and yet I had no idea that these monuments existed until a few days ago. Sometimes we are blind to – or maybe choose not to see – what is right in front of us. We find the treaty monument and notice it does have a sign – a tiny brown “Point of Interest #3” sign. We joke about whether we have seen points of interest one and two, and then walk briskly into the open green space, bordered by trees with a tall, white monument standing proudly in the middle. Our pace quickens because we are all excited to critique the monument and compare/contrast it with the monument put in place by the First Nations Chiefs. A hush falls over us as we move around the monument to read the plaques. “Ceded all their rights, titles, and privileges to all lands?” asks Meagan incredulously. “That is so crazy.” We are all murmuring our disbelief at this misrepresentation of Treaty. Mike nods at our reactions. He knew this was coming. “I was expecting the language to be problematic, but I wasn’t expecting it to be historically inaccurate,” I say, shaking my head. 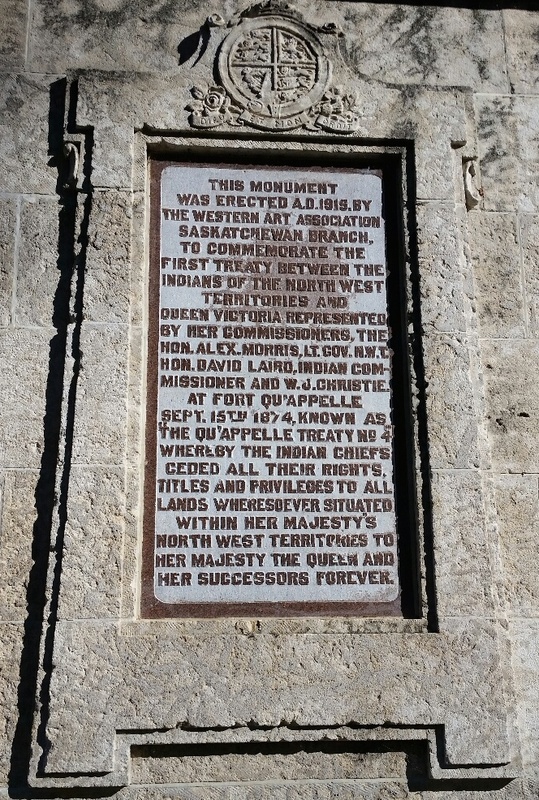 I think about the stark contrast between the explanations of Treaty on the two monuments. Solemn promises, sharing the land, peace, the spirit and intent of Treaty. Ceded all their rights, titles, and privileges to all lands forever. As we walk away, Christine mentions how appropriate it is that the monument is white. We laugh. She is right; it was put in place by white people and for white people. This understanding of Treaty is the one that has benefitted the Europeans and disadvantaged the First Nations peoples for years and years. We decide to take a drive over to Lebret before we head back to Regina. I express my frustration that Lebret is even closer to where I grew up – I even went church in Lebret when I was a little girl – and I had only found out about two weeks before that there had been a residential school there. How was I so blind to the history that was right in my backyard? 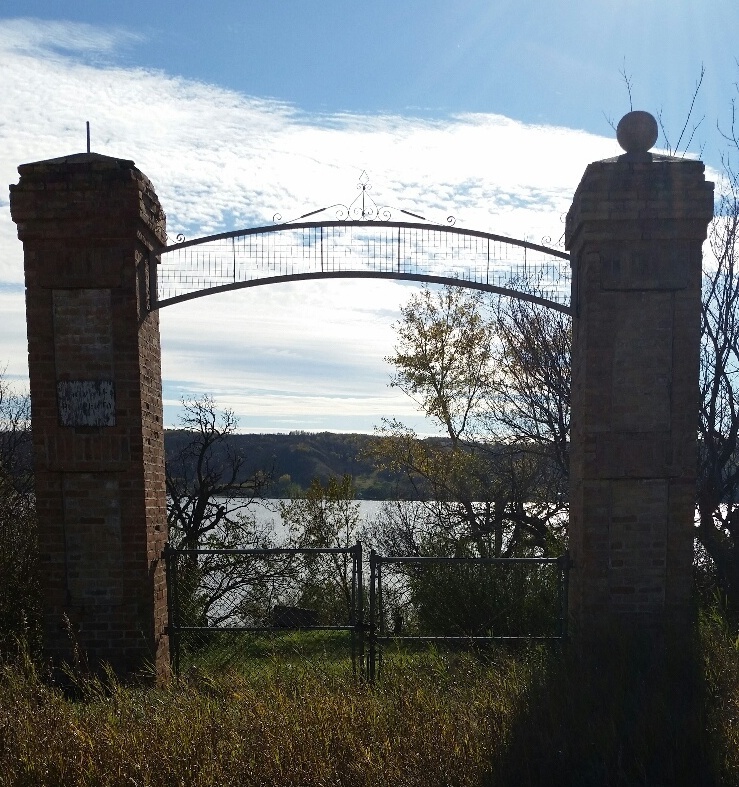 As we drive toward Lebret, someone points out some brick pillars on the side of the road and asks what they are. I have never noticed them before and no one knows for sure what they are. We decide to go see the beautiful Sacred Heart church first and then go back and check it out. The church is breathtaking. Mike stops the vehicle so Meagan can stand up and take pictures through the sunroof. We turn around and go back to the brick pillars we saw. Mike pulls over and we all pile out and cross the road, eager to explore. “Could it be the residential school gate?” we wonder. We don’t know for sure but we can’t think of anything else it could be. We walk a little further down, behind the gate. It is exquisite. The sun shines down on us and shimmers across the lake. We take it all in. 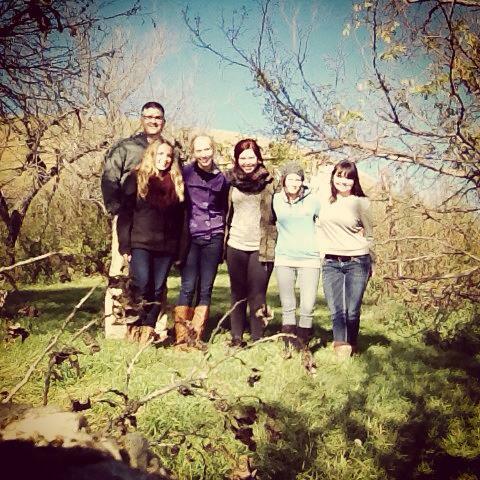 We take a group picture, capturing the beginning of STARS: Student Teachers Anti-Racist/Anti-Oppressive Society. I am grateful to be a part of this group. Together, we are exploring the past and seeing connections to our society and our lives today. Together, we are learning and making decisions about what actions we can take as people and as teachers because of that learning.